Under the Mat is a world with real people, real lives, fame, fortune, triumph, tragedy and misery. This is the only world Diana Hart Smith had ever known. Born into a family of wrestlers, becoming part of the family business was unavoidable. Diana’s life was consumed by the sport. The Harts are perhaps the most famous professional wrestling family in history. Her father, Stu Hart, passed down his hard-hitting, never-say-die wrestling technique to some of the WWE’s biggest names – including his son Bret ‘The Hitman’ Hart and WWF’s Chris Jericho. Under the Mat recounts Diana’s life growing up in the bizarre world of wrestling surrounded by sports superstars like, Mohammed Ali, Hulk Hogan and Andre the Giant. She writes about being the little sister in a large, dysfunctional family. They lived like the Beverly Hillbillies in a mansion overlooking Calgary. When Diana’s brother Owen Hart died in the ring the family spilt apart, and so did her tumultuous marriage to ex-husband the late Davey Boy Smith. With the help of bestselling author Kirstie McLellan Day, Diana tells her story, a story so shocking that some of her family members fought to have it pulled from the shelves. 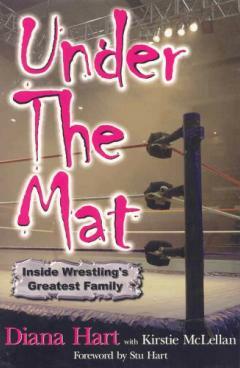 Under the Mat is the most brutally honest account of the real world of professional wrestling ever told.